Galápagos Island giant tortoise populations are one species richer after announcements by investigators of genetic data and shell shapes from Santa Cruz Island’s eastern-dwelling, 250-member community on Wednesday, October 21, 2015. The slow-moving reptilian grazers in question bring the west Pacific archipelago’s world-famous giant tortoise species to new totals of 15. Chelonoidis donfaustoi commemorates Galápagos National Park’s recently retired, 75-year-old ranger. Yale University evolutionary biologist Adalgisa Caccone deems Don Fausto Llerena Sánchez’s tortoises most closely related to San Cristóbal Island’s Galápagos giants. Each of the six larger Galápagos Islands exhibits species adapted to different niches within distinct insular ranges of diverse arid to lush habitats. 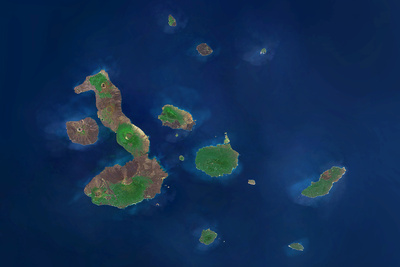 Santa Cruz Island now finds itself harboring eastern- and western-specific species. Santa Cruz Island tortoise (Chelonoidis nigra porteri), also known as Indefatigable Island tortoise and as Western Santa Cruz tortoise, shares second largest island in Galápagos archipelago with newly identified Chelonoidis donfaustoi. The 15-square-mile (38.85-square-kilometer) Cerro Fatal 6+ miles (9.66+ kilometers) from La Reserva’s 2,000-member Chelonoidis porteri community gets called home for Don Fausto’s drought-tolerant tortoises. Its arid, lava-riddled lowlands harbor smaller-sized descendants of ancestors less than 500,000,000 years old. The Western Santa Cruz Tortoise contrastingly is the larger-sized descendant of 1,740,000,000-year-old ancestors. Scientists judge species as reluctant to interbreed. But Dr. Caccone and colleagues Linda Cayot, Galápagos Conservancy science advisor, and James Gibbs, State University of New York College of Environmental Science and Forestry conservation biologist at Syracuse, know of exceptions. Analyzing mitochondrial and nuclear DNA from live tortoises and Galápagos, United Kingdom, and Wisconsin museum specimens leaves no doubt of eastern traces in the London-stored western holotype. San Cristóbal, Santa Cruz, Santiago. vegetation and water by cattle, goats. Don Fausto’s tortoises contrastingly submit to internally stored food and water reserves for 12- to 18-month hungry, thirsty stretches. Pre-twenty-first-century predation for meat, oil. So they both urge ecological prioritization. Light gray area connecting distribution areas of two species represents agricultural land. Becker, Rachel A. 21 October 2015. “New Giant Tortoise Species Found on Galápagos Islands.” National Geographic > Weird & Wild. Retrieved October 24, 2015. Belluck, Pam. 21 October 2015. “New Species of Galápagos Tortoise Is Identified.” The New York Times > Science. Retrieved October 24, 2015. Casey, Michael. 22 October 2015. “New Species of Tortoise Found on Galapagos Island.” FoxNews > Science > Reptiles. Retrieved October 24, 2015. D’Estries, Michael. 22 October 2015. “New Galapagos Giant Tortoise Species Found Hiding in Plain Sight.” Mother Nature Network > Earth Matters > Animals. Retrieved October 24, 2015. Dunham, Will. 21 October 2015. “Shell Game: New Species of Galapagos Giant Tortoise Identified.” Yahoo! News. Retrieved October 24, 2015. El Espectador (@elespectador). "(En imágenes) 'Chelonoidis donfaustoi', la nueva especie de tortuga gigante en Galápagos." 5:20 p.m. Oct. 21, 2015. Tweet. Feltman, Rachel. 23 October 2015. 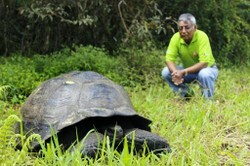 “New Species of Giant Tortoise Discovered in Galapagos.” WA Today > Environment > Animals. Retrieved October 24, 2015. “Galapagos Giant Tortoise.” Galapagos Conservation Trust > Wildlife > Reptiles. Retrieved October 24, 2015. Geggel, Laura. 21 October 2015. “New Species of Giant Tortoise Found in the Galápagos.” Live Science > Animals. Retrieved October 24, 2015. “Giant Tortoises.” Galapagos Conservancy > Biodiversity. Retrieved October 24, 2015. “Galapagos Researchers Find ‘Extinct’ Tortoises Are Still Alive.” FoxNews > Technology > January 15, 2012. Retrieved October 24, 2015. Hathaway-Yale, Bill. 22 October 2015. “Giant Tortoise in Galapagos Is a New Species.” Futurity > Sci-Tech > Science and Technology. Retrieved October 24, 2015. Hillen, Brittany. 22 October 2015. “New Galapagos Islands Tortoise Species Discovered.” SlashGear. Retrieved October 24, 2015. Marris, Emma. 21 October 2015. “Genetics Probe Identifies New Galapagos Tortoise Species. Nature > News. Retrieved October 24, 2015. Milliken, Grennan. 21 October 2015. “Discovered: A Brand-new Species of Giant Galapagos Tortoise.” Popular Science > Animals. Retrieved October 24, 2015. “New Galapagos Giant Tortoise Species Found.” Sky News > Culture > Offbeat > 22 October 2015. Retrieved October 24, 2015. “A New Galapagos Giant Tortoise Species Is Named.” Galapagos Conservancy > Newsroom > October 21, 2015. Retrieved October 24, 2015. “New Giant Tortoise Species Identified on Galápagos Islands.” Newsmax > The Wire > 22 October 2015. Retrieved October 24, 2015. “New Species of Giant Tortoise Discovered in Galapagos.” BBC News > Latin America & Caribbean > 22 October 2015. Retrieved October 24, 2015. “New Species of Giant Tortoise Discovered on Galapagos Islands.” teleSURTV > News > Latin America > 21 October 2015. Retrieved October 24, 2015. Nicholls, Henry. 21 October 2014. “Galapagos Gets a New Species of Giant Tortoise.” The Guardian > Science > Animal Magic. Retrieved October 24, 2015. Nuwer, Rachel. 21 October 2015. “New Species of Galapagos Tortoise Found on Santa Cruz Island.” Smithsonian > Science > Nature. Retrieved October 24, 2015. “Scientists Identify New Galapagos Giant Tortoise Species.” Phys.Org > Biology > Ecology > October 22, 2015. Retrieved October 24, 2015. Solano, Gonzalo. 21 October 2015. “New Species of Tortoise in Galapagos Claimed.” Business Insider. Retrieved October 24, 2015. Solano, Gonzalo. 21 October 2015. “There Is a New Giant Turtle on Galapagos.” U.S. News & World Report > News > Science. Retrieved October 24, 2015. Stannard, Ed., 21 October 2015. “New Tortoise Species Found in Galapagos; Yale Biologist in on Discovery.” New Haven Register > News. Retrieved October 24, 2015. SUNY College of Environmental Science and Forestry. 21 October 2015. “New Giant Tortoise Species Found in Galapagos.” Retrieved October 24, 2015. 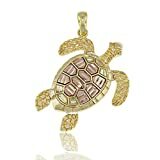 WriterArtist, Thank you for appreciating tortoise and turtle species. The spring peepers are out in the vernal pool behind the shed. I heard the first bluebird sing around the white pine today around 9 a.m. There's hope that I'll start seeing my eastern painted, eastern musk, snapping and woodland box turtles and eastern river cooters soon. Slow and steady, some of the tortoise species are the longest living creatures on earth. Aren't they amazing? Having survived the struggle of one of the fittest species on the planet. MBC, So many answers can be found, so many questions raised, and so much beauty found in Galápagos! Isn't Ecuador lucky in claiming them?! Had a friend who went to the Galapagos, had a wonderful time! Thanks for another interesting article. blackspanielgallery, They certainly are, even without considering how widespread they once were and what a super-reduced habitat they survive in now.